(SPOT.ph) The Land Transportation Franchising and Regulatory Board (LTFRB) has prohibited UV Express vehicles to traverse EDSA. The LTFRB announced the new policy through a memorandum dated July 28, stating that UV Express "shall no longer be required to traverse a specified/particularized route." 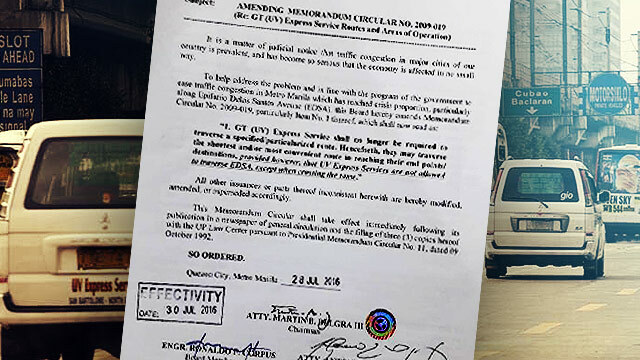 This means that UV Express vehicles can only pass through EDSA when crossing towards the other side of the major thoroughfare like the Quezon Avenue and Shaw Boulevard intersections. Drivers and transport groups are not pleased with the ban, saying that this will increase their travel time and inconvenience passengers, reports InterAksyon. Meanwhile, Metropolitan Manila Development Authority officer-in-charge Emerson Carlos told Philstar that UV Express vehicles provide "point-to-point" services, which means they are allowed to take any route or the route which the driver thinks is the shortest or most convenient one. Carlos explained further that this allows UV Express drivers to plot their preferred alternate routes, unlike other public utility vehicles which already have fixed routes to follow. He adds that random passenger pickups are not allowed during the travel duration. The new policy took effect on Saturday, July 30. Violators will be apprehended by MMDA traffic enforcers.